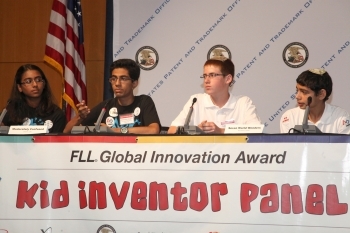 Yesterday, the Commerce Department’s United States Patent and Trademark Office (USPTO) hosted the second annual First Lego League (FLL) Award Ceremony, where two teams of young inventors ages six to 14 each won an FLL Global Innovation Award and a $250,000 investment to help develop their ideas for the marketplace. Both teams invented products related to this year’s theme: food safety. The Dublin, Ohio team Moderately Confused, inspired by food spoilage caused during delivery, created the “Erasable Barcode”; if the temperature of an environment becomes unsafe for food, ink attached to the barcode will obscure a portion of the label so that the spoiled product cannot be sold. Dean Kamen, the inventor of the Segway, founder of For Inspiration and Recognition of Science and Technology (FIRST), and recipient of the National Medal of Technology and Innovation issued annually by the White House, presented the awards to the two winning teams and the two runners-up. Food and Drug Administration Commissioner Dr. Margaret Hamburg spoke to the students, and Rep. Chaka Fattah, who has been actively involved with FIRST and youth mentoring, met with participants after the ceremony. The Department of Commerce congratulates all of the young inventors who participated in the competition and thanks the generous sponsors who are helping bring their innovations to life. The FLL Global Innovation Award is an inspiring example of how businesses, private organizations, and government can work together to cultivate a spirit of enterprise and ingenuity in our nation’s youth.